Srinagar is one of the most beautiful and impressive cities across India. Surrounded by lakes and mountains Srinagar is the largest settlement in the disputed region of Jammu and Kashmir. It is located in the valley of Kashmir on both sides of the Jhelum River, which is a tributary of the sacred river Indus. From the capital Delhi, Srinagar lies a distance slightly less than 900 miles north. 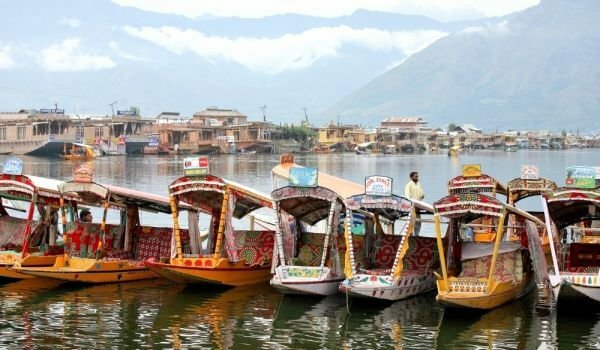 Although today Srinagar is quite busy, it has managed to preserve its romantic atmosphere reminiscent of Venice, because local drift boats and ship houses. Especially striking here are the two old bridges that connect the two divisions of the city. The unique house-boats are located around the shores of nearby bright lakes, mostly along the coast of Dal Lake. The name of the city has its etymological meaning in Sanskrit. It is a combination of two words - GIF, which means wealth and abundance, and soot, which translates as a city. Sri is also the name of Hindu and Goddess Lakshmi. In literal translation Srinagar city means of abundance and wealth. Situated in a favorable climate zone, Srinagar for centuries has been a favorite resting place of the great Indian rulers. They came here to escape the annoying summer heat. From Mongol rulers, who also preferred Srinagar recreation have come unique historical monuments, mosques and beautiful gardens. Some of them are Chazma Shahi, representing the royal fountains, palace of fairies - Pari Mahal, the garden of spring - the niche Bagh and others. Srinagar has a long history from more than the 3rd century BC. A settlement was formed around 2000 years ago, under the leadership of King Pravarasena II. The mixed culture here is particularly attractive to tourists who come to see this place and the traditions of several religions. One of the places in Srinagar is the Shankaracharya temple which was built in 371 BC in honor of Lord Shiva. The holy place stands on a hill about 335 meters high, where a wonderful view of the whole area opens. The best time to visit Srinagar is spring, summer and autumn. Although the climate here is favorable year-round, winter is very cold and very snowy.